Barra: "We will redefine customers and their personal mobility." MILFORD, Mich. (Reuters) -- General Motors moved to convince Wall Street that its recovery is gathering momentum with improving margins, strong brands, new markets for high-tech vehicles, and prospects for stronger profits in coming years. The automaker said today it is targeting an increase in earnings per share to between $5 and $5.50 per share, from its goal of $4.50 per share this year. GM said it will increase its return to investors by stronger profit margins in China and North America, as well as operating efficiencies and share buybacks. In an annual presentation to investors in suburban Detroit, GM said its pre-tax global margins target is 9 percent to 10 percent by 'early next decade." GM, which reported a 12-percent rise in U.S. September sales, has had a difficult time convincing Wall Street of its value and its shares have fallen below $30 recently, well short of its 2010 initial public offering of $33 per share. That IPO came a little over a year after GM emerged from a government-funded bankruptcy in which the company pared four of its brands and much of its U.S. dealership network. GM said it will have revenue of $155 billion this year as well as global margins of 6.8 percent and a 24 percent return on invested capital. Shares rose 1.6 percent to $30.49 at 10:53 am ET today on the New York Stock Exchange, while the broader market was down slightly. The company will save about $5.5 billion in the next three years in efficiencies in manufacturing, administration and purchasing, which will pay for investments in technology and brand development. The savings through 2018 will "more than offset" the technology and brand investments, GM said. GM Chief Executive Mary Barra said the company will develop its autonomous vehicle program by having its employees at its primary technical center in Warren, Michigan drive a fleet of plug-in hybrid 2017 Chevrolet Volts. It plans to launch a citywide car sharing service in the U.S. in early 2016, expanding efforts to compete for revenue from consumers who want to pay for using cars instead of owning them. GM plans for 39 percent of its global sales to come from new or refreshed vehicles, up from 26 percent this year. It said that the share of those new vehicles will be 40 percent of its total sales in 2017, 31 percent in 2018, and 40 percent in both 2019 and 2020. Barra said she has not had any further contact with Fiat Chrysler Automobiles. Several months ago, Fiat Chrysler CEO Sergio Marchionne sent Barra an email saying he wanted the two companies to merge, a notion Barra has consistently said she and the company's board of directors are not interested in. GM said it expects $9 billion to $10 billion of annual free cash flow by 2020. 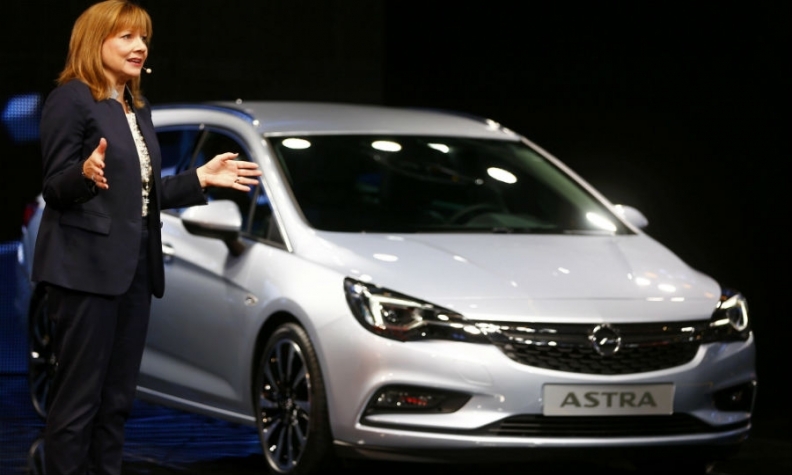 GM expects industry growth in China of 3 percent to 5 percent each year from 2014 to 2020. One of major reasons that GM shares have fallen recently is that its China sales are threatened by a general weakening of the world's top auto market and No. 2 economy. While the electric vehicle market has been pressured by low fuel prices in 2015, a lowering of the costs of EV battery cells will fall by 2022 to the threshold of $100 per kilowatt-hour that analysts have said will allow EVs to compete with vehicles fueled by petroleum. Currently, the cost of battery cells is about $145 per kWh. Global auto sales industrywide will grow by more than 50 percent to 130 million vehicles by 2030, from about 85 million now. While GM is not interested in merging with FCA, it expects to gain $2 billion to $3 billion in savings from developing technology with other automakers.